I am 21 and just bought a new place with a big yard and I had been wanting a dog for some time. 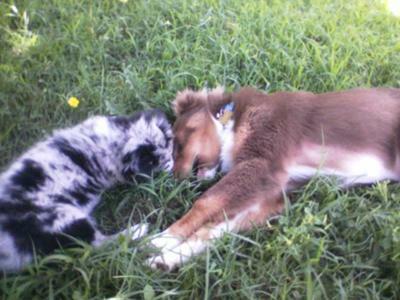 I researched every dog known to man and stumbled across Australian Shepherds the breed sounded so perfect for me! Crazy I know, So there in the Newspaper one Sunday I saw the ad and rushed to come home with a Red tri Aussie! He had more than 20 names that first day but Kieko it was. He was everything Awesome and More! 5 months of Adventures with Kieko and I thought a mate would be Awesome for him to play like a dog with! So the search began and went and went! I needed a tough dog that could stand up to and fear nothing similar to Kieko but maybe a dog that was more relaxed! I found through the fantastic internet a well priced Beautiful Aussie on a farm not quite old enough to bring home just a few short hours away! So the weeks went by as I wondered how it would change my world, and what would it be like? 2 Australian shepherds no one could give me an answer So I just tried it! we drove to the farm! It was a good feeling Nahla I had already named her was kind of timid and did not like to be held much went on the long journey back to her new home in a Car with myself, Kieko, and Danny! At home she opened up more and more each day and life has been great for the 2 of them! It is a perfect balance they are like glue to each other and me! They play until they fall down and run and have a great time like the great dogs they are! I do not plan to breed but they will be best of friends and have a special place with me for a long time to come!